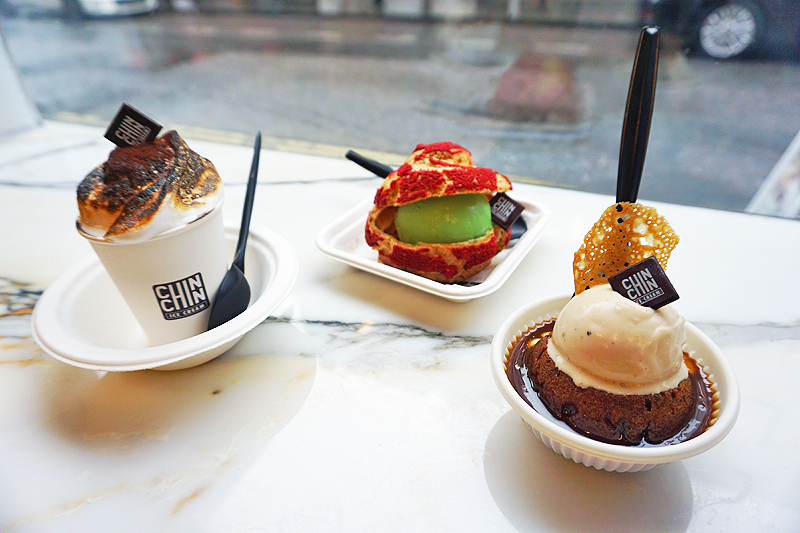 I admit my visit to Chin Chin Dessert Club was fuelled by Instagram after I kept seeing pictures of their infamous hot chocolate with torched marshmallow all over my feed. So did they live up to the social media hype? Chin Chin Hot Chocolate With Torched Marshmallow (£4.50): The marshmallow was cloyingly sweet. After just a few spoonfuls, it was too much and I say that as someone with a big sweet tooth. It was more bearable when mixed with the hot chocolate, but there was just so much of it and the consistency was so thick that it was hard to reach the hot chocolate beneath without spilling it all over the sides of the cup (hence the need for the bowl). As for the hot chocolate, it was smooth and not as thick as the ones from Angelina and Paul, but tasted less of pure dark chocolate and more like cocoa powder. Overall, the drink/dessert was just too sweet, which was disappointing as it was the reason for my visit to Chin Chin Dessert Club in the first place. Choux Bun Sandwich (£5.45): You can choose what ice cream flavour to go inside your choux and I opted for the pandan flavour, which is actually vegan and a weekly special. The pandan ice cream was smooth, not too sweet and had a surprisingly strong pandan taste. The choux was light, airy and despite its red exterior, had no particular flavour, so its neutrality went well with the pandan ice cream. The choux bun sandwich usually comes with raspberry sauce and olive oil crème patisserie, the second of which I asked to be omitted as I thought it would taste strange with the pandan ice cream. I should have asked for the raspberry sauce to be omitted as well because as nicely sharp and tart as it was, it tasted weird with the pandan ice cream. With the exception of the raspberry sauce, the choux bun sandwich was my favourite out of the three desserts. I would go back just for the pandan ice cream and hope it becomes a permanent flavour! Sticky Toffee Warmie Sundae (£5.75): Like the hot chocolate, this was sickeningly sweet, which was mostly due to the caramel sauce. For some reason, it tasted almost medicinal? I don't know why but there was an undercurrent taste to it that reminded me of cough syrup. The cake was moist and the tonka bean ice cream, which is essentially vanilla ice cream, was smooth and not too sweet but I found the flavour too mild (although I suspect this is because it was overpowered by the caramel sauce). Overall, the sticky toffee pudding was underwhelming and I've had better ones elsewhere. The prices are a bit steep considering that the portions are actually smaller than they look in photos. Also, the place is very small and cramped, and the music is way too loud.